Sunday Edition and Fall Giveaways! 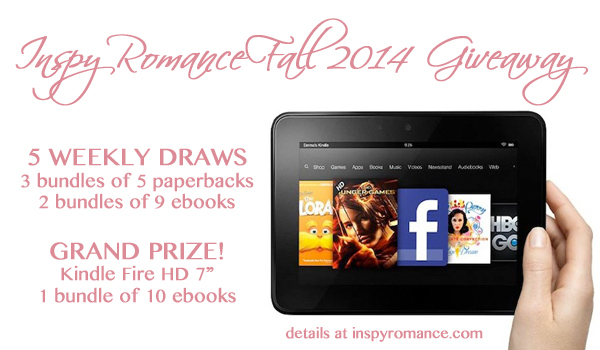 Valerie here again, and I’m SO excited to share our FALL 2014 GIVEAWAYS with you! We’re on Week 3 now. Keep reading to see if you are one of our winners! The Inspy Romance authors have gotten together to offer FIVE WEEKS of giveaways including paperbacks and ebooks, Christmas stories and nonseasonal. And at the end of the giveaways, we’re offering a GRAND PRIZE of a Kindle Fire! Already have a Kindle Fire of your own? Just think what an awesome Christmas present you’ll have for someone special! There are weekly prizes and a grand prize. To qualify for a weekly prize, comment on the week’s posts. For bonus entries, refer to the Rafflecopter below. Saturday evening we’ll select a winner for the previous week and post your name in Sunday Edition. For five weeks! To qualify for the grand prize, we’ll pick from all five weeks’ worth of Rafflecopter entries and all five weeks’ worth of comments. The grand prize winner will receive the Kindle Fire HD 7 tablet AND an ebook bundle to read upon it. We’re delighted to offer this set of giveaways and hope you’ll share the news with your friends. Pin the above image to Pinterest or share it on Facebook. Send a tweet! We appreciate your help in finding new readers for Inspy Romance. Nancy K and DK Stevens!! You are the winners of Lindi Peterson’s Rich in Hope. Remember, every comment you leave gets you an entry into a drawing for a $30 Amazon card! On Monday, Carol Moncado celebrated It’s Release Day… and a Giveaway! In fact, she has a Release Extravaganza Giveaway on her website until December 22. Go check it out! On Tuesday, Lindi Peterson introduced herself and her romance fiction In the Beginning… and Giveaway! On Wednesday, Lynette Sowell introduced us to Books, Books, and More Books! On Thursday, Merrillee Whren talked about what Sadie Hawkins Day has to do with her next release, Second Chance Reunion. On Friday, Kimberly Rae Johnson shared her thoughts on Silent Night Standoff. Comment before November 20 to be eligible to win a copy! On Saturday, Annalisa Daughety talked about a few of her favorite things. What are some of yours? SCROLL BACK UP to enter our Week Three Giveaway!